The safety of dental x-rays is a legitimate concern that parents have! At Alligator Dental we value the well-being of the child first and foremost. We use cutting edge digital x-ray equipment to dramatically reduce radiation and ensure the highest safety of our patients. Yes! 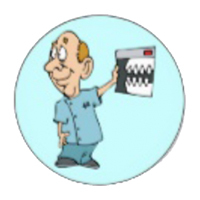 X-rays are necessary for accurate diagnosis of dental cavities and pathology. Without them a comprehensive exam is incomplete. Proper diagnosis of tooth development and potential decay requires the dentist to view the jaw and developing adult teeth that are behind the primary (or baby) teeth. X-rays also allow the dentist to see the extent of decay that is visible to the eye and determine the proper treatment needed to repair the damaged tooth. We want parents to feel comfortable with the service their child receives at Alligator Dental. Feel free to ask your dentist about dental x-rays if you have concerns!